The foundation has a grant review meeting in late October each year to review and award the grant recipients. Please submit your Grant Application by October 3rd, 2018. Download by clicking on the blue download button. The Education Foundation was a leading factor in the establishment of a Youth Apprenticeship Program for the Plastics Industry here in the state of Wisconsin, supporting it with commitments of participation, funding and scholarships. The Foundation has sponsored twelve or more middle and high school teachers at an annual four-day course on Plastics Technology instruction at the University of Wisconsin Platteville. Tuition and teaching materials were provided by the Foundation to the attendees who utilized their summer vacation to enhance their knowledge about plastics and learning how to gear their instruction to a younger generation. Pictured is Jack Hill (SPE Education Foundation Treasure) and Darcy Davis. Darcy is the 2016 winner of the Bob Mehn scholarship award winner in the amount of $2000. 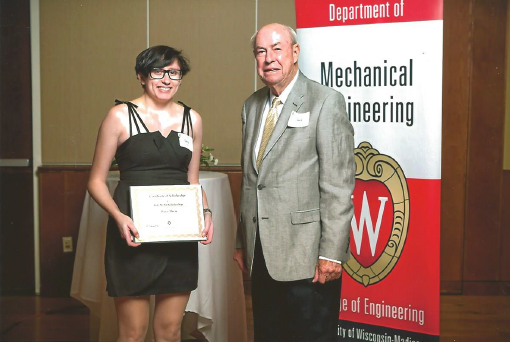 Read Darcy’s Letter – uwm-spe-bob-mehn-winner-letter-201610.